I had the pleasure of a visit from my old friend Alan Syliboy this past Wednesday. 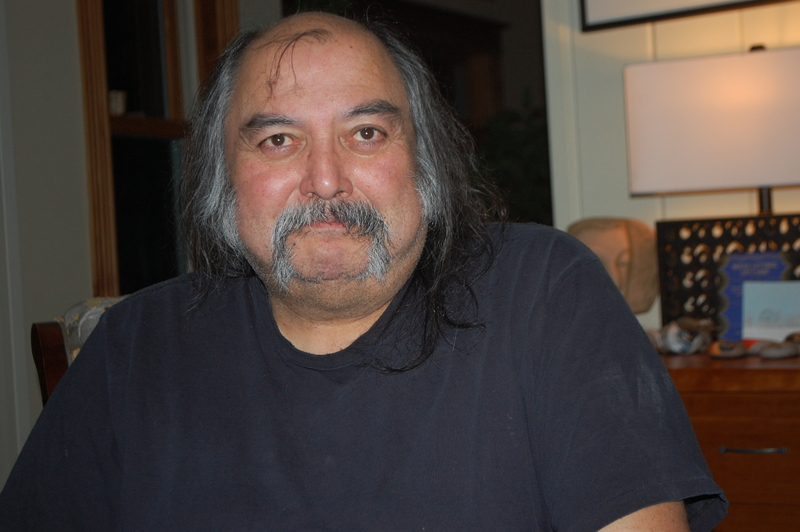 Many of you know Alan as one of Canada’s top First Nations artists and may be familiar with his work. He hails from Indian Brook First Nations in Truro and displays his work locally at the Down to Earth Gallery in Antigonish. You can see his large commission at the People’s Place Library and his new mural at the Halifax Airport. Below are some photos of Alan’s paintings. Many of his new works are on drums, some big, some small. One of my favorite paintings is one he did of a white moose in honour of the one that was shot by a hunter in Nova Scotia not so long ago – who apologized once he understood the gravity of his action. And here is Alan at my house after we shared a great dinner. Alan and I go way back to our NSCAD days in the mid nineties when I was gainfully employed there. Since that time we’ve shared many great experiences including an international cultural conference in Paris in 2004 where we may have been a touch irreverent – but that’s the east coast in us. Alan’s son Evan even lived at my house as a student of the StFX jazz program and has gone on to play in the band called Lone Cloud with his father. They won an ECMA in 2013. Check them out on Facebook here.